Brazil dismantles Amazon 'destroyers' Jump to media player Police in northern Brazil say they are in the process of dismantling one of the country's biggest environmental criminal gangs. Amazon under threat by illegal mining Jump to media player A surge in illegal gold mining has destroyed vast areas of the Amazon forest in Brazil. Amazon tribe fights Brazil dam project Jump to media player An indigenous group in the Amazon is taking a stand against Brazilian government plans to build a series of dams which threaten to flood their land. Amazon tribe threatened by logging Jump to media player Justin Rowlatt reports from the Brazilian Amazon for BBC Newsnight. Amazon farmers on what their land means Jump to media player After more than a century of struggle, poor Brazilian farming families along the Tapajos river, a tributary of the Amazon, have won rights to their land. The lost caves of the Amazon Jump to media player Beneath the Amazon rainforest, scientists have recently discovered hundreds of massive caverns in the rich deposits of iron ore.
Brazil to survey Amazon rainforest Jump to media player The Brazilian government has announced that it plans to undertake the huge task of recording an inventory of the trees in the Amazon rainforest. 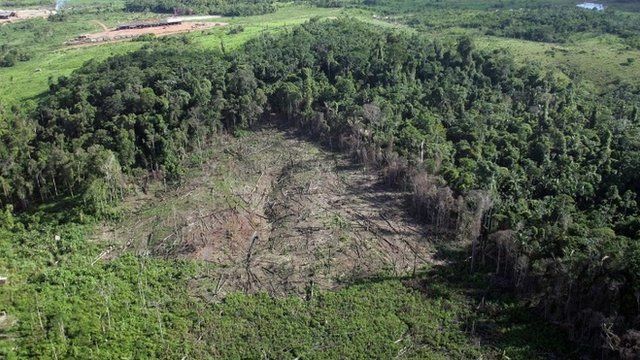 The authorities in Brazil say they have dismantled a criminal organisation they believe was the "biggest destroyer" of the Amazon rainforest. The gang is accused of invading, burning and selling large areas of public land.